Rhonda Griffis, PBSC interim program director for Cosmetology and chair of the Florida State Board of Cosmetology, spoke at the “Florida Deregathon,” an initiative to eliminate regulations that put unnecessary burdens on licensed professionals and businesses. Click image to view Griffis’ segment, starting at 17 minutes, 53 seconds. See link to Gov. DeSantis’ remarks below. Gov. Ron DeSantis didn’t wait long to take action on his campaign promise to reduce regulations that make it hard for Floridians to enter or remain in a profession or start a business. 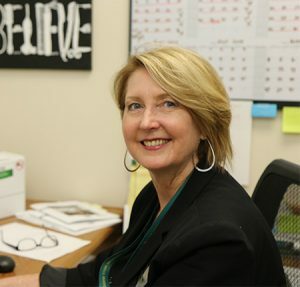 He invited the members of Florida’s 23 professional licensing boards to Valencia College in Orlando on Jan. 31 for the first “Florida Deregathon,” and Palm Beach State College’s Rhonda Griffis was there. Griffis, PBSC’s interim program director for Cosmetology, acted in her role as chair of the Florida State Board of Cosmetology and spoke for her profession at the daylong workshop. After an opening session with remarks by DeSantis, the licensing boards met individually to discuss, debate and target regulations that could be immediately eliminated or modified. In the afternoon, each board presented its recommendations. Florida already has one of the lowest cosmetology training requirements in the nation—1,200 hours compared to the national average of 1,500—and as a result, the Board of Cosmetology was unified against lowering the training hours requirement. However, on behalf of the board, Griffis offered several proposals to ease barriers, including reciprocity and specialty licenses. Florida already has the policy to endorse the licenses of cosmetologists from states with higher training requirements. In order to open the door as wide as possible, the Board of Cosmetology recommends license reciprocity be given to cosmetologists from states and territories where the requirements are lower, such as Massachusetts and New York, which require 1,000 hours. Griffis also outlined the board’s proposal to develop more specialty licenses. According to Griffis, the board’s recommendations were well received by the Deregathon attendees, including consumers and industry leaders. No official vote or action was taken that day, but all recommendations will be considered by the state Legislature in the weeks ahead. 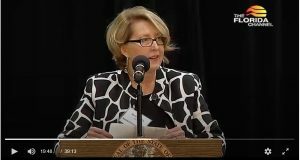 Part 2: Presentations of the professional licensing boards; Rhonda Griffis’ segment starts at 17 minutes, 53 seconds. Congratulations, Rhonda! thank you for using your voice and experience to raise awareness on regulations and their restrictions to entrepreneurs, small businesses and students taking different paths to success. Way to represent Palm Beach State College and your industry Rhonda! We are lucky to have you on our team!